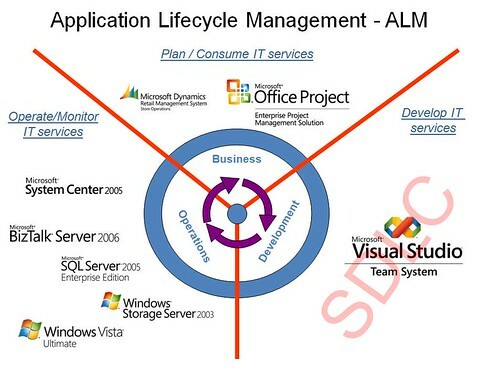 ALM == Application Life Cycle Management; as the name suggests includes everything that is part of the Application Lifecycle. When does the life of an apps start? No, not in development, it starts somewhere in the business as an idea, a need, a challenge, a risk. When does the life of an application end? No, not at the end of development, but when the application is no longer used by the business - potentially many years after the initial development. These days the SDLC is typically iterative in nature, but so is the Application life Cycle! As the business responds to an ever changing environment, we start yet another ALM cycle to update, enhance the application and redeploy so the business can realise the benefits. Great visual. I was looking for something like this and this is the first that nails what I was after, however only MS products. What context can this be put into? IT support services(interna;l)? Would it change when extrapolated to business contexts where an application is the product they sell. Thanks for sharing your thoughts and knowledge with the audience, its very helpful for me as well as other who are looking for this kind of stuff. The basic difference between ALM and SDLC is not known to many, basic but very important, as you said I can say SDLC is part of ALM, and ALM is a bigger idea that starts with concept development and ends with application end. So, if there is version change in an application, is it end of ALM or a stage in its lifecycle, for me a stage …maintenance stage. TFS has come along way since 2007. Today I believe it is a ALM tool in that it can be used to do everything from capturing the user stories from the business and provide cohesion all the way through the test cycle and on into deployment. Thanks for taking a stab at this distinction. I do have to disagree though. The SDLC has always been defined as the disciplines of software development from cradle (business concept) to grave (end-of-life activity). Therefore, I am still confused at the distinction between ALM and SDLC. If I look at your image, it tends to support my vision of what ALM is; an integrated suite of tools that supports the SDLC. I like your comment about the iterative nature of the SLDC but that has been the case since at least 1984 when Barry Boehm defined the spiral model. Thanks again for your take. I'm still trying to figure out what this ALM thing means.